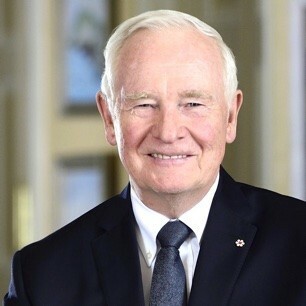 One of Canada’s most respected and beloved governors general, David Johnston is a graduate of Harvard, Cambridge and Queen’s universities. He served as dean of law at Western University, principal of McGill University, and president of the University of Waterloo. He is the author or co-author of twenty-five books, holds honorary doctorates from over twenty universities, and is a Companion of the Order of Canada (C.C.). Born in Sudbury, Ontario, he is married to Sharon Johnston and has five daughters and fourteen grandchildren.